Trent Richardson has averaged 2.8 yards a carry in Indianapolis. 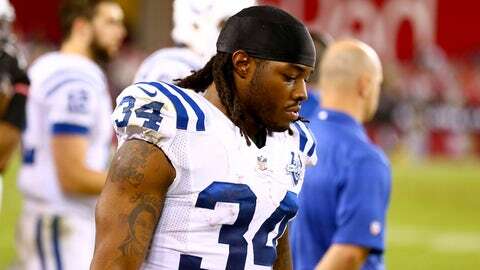 Trent Richardson’s struggles in Indy haven’t been a secret. Even opponents are noticing a difference in his play and believe that the 2012 first-round running back is “probably afraid of getting hurt,” according to Titans defensive tackle Jurrell Casey. "With a guy like [Trent], everybody knows he’s a downhill runner," Casey told FOXSports.com in a telephone interview. "A lot of times guys shoot at his legs. He’s a smaller guy so nobody tries to hit him up high. Richardson, who was replaced by Donald Brown before last week’s 22-14 win against the Titans, has averaged a paltry 2.8 yards a carry in 10 games since the blockbuster trade in September. Brown has made the most of his opportunity, running with a reckless abandon. "I think the biggest difference between the two is Donald Brown, he’s not caring." Casey said. "He’s giving up his body and just running through the holes at full speed. He’s not breaking down and trying to see if he can shake a guy in the backfield. If he’s in the backfield he’s coming through. The first time he’s going to make a move is once he crosses that second level. He’s a straight power back. “Then Trent Richardson, you can see sometimes, he does a little tip-toe through the line and tries to figure out what he’s going to do before he gets to the hole." Richardson was the No. 3 overall pick in the 2012 NFL Draft. Despite playing with broken ribs, he ran for 950 yards and 11 touchdowns during his rookie season in Cleveland. The Browns sent Richardson to Indianapolis earlier this season in exchange for a first-round pick in the 2014 NFL Draft.